Sittler Windrow Turner Model #1014, shown above, is ideal for large farm, municipal and industrial composting. Sittler windrow turners are known and respected for reliability, affordability, ease of operation and efficiency. This unit is tractor pulled to eliminate the possibility of an engine breaking down, bringing composting to a standstill, particularly in the first 3 weeks, potentially jeopardizing the quality of the compost. Tractors can be easily maintained and replaced if required. Engine down time in Self propelled or In Vessel units usually means odour problem time. The same tractor equipped with a loader can be used for construction of the windrow and other work requirements when the windrow does not require turning. The compost operation can be expanded in low cost modules with additional turners as required allowing for practical cost effective expansion. Due to reduction in size of the compost, any windrows started with the same materials at the same time can be combined in the 3rd -4th week. For less than the cost of a large self propelled you could purchase 2 of our 1014 pull types and 2 tractors for up to 5400 cubic yards turning capacity per hour. Peaked Windrow for Efficient CO2 Flow. 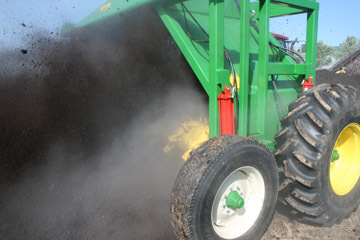 The unique drum formation lifts and aerates the entire windrow and leaves the windrow in a sharp peak allowing for proper airflow, keeping the windrow aerobic and, therefore, minimizing odours. Sittler windrow turner drums gently lift and invert the entire windrow bringing ingredients from the outside to the inside and bottom to top without destroying developing humus colloids. This method provides the ideal atmosphere for microbes to perform the functions necessary at each stage of the composting cycle. The hydraulic drive wheel on the right side of the 1014 windrow turner offers optional additional stability in new, possibly dense, windrows or slippery surfaces. Sittler compost windrow turners require only standard maintenance; many are still in operating condition after 15-20 years of service. The watering system is standard (see specifications) and consists of up to 4 water nozzles that can be independently operated, connected to hoses leading to a folding, removable tow-bar. The watering system can hook up to a water wagon attached to the tow bar or it can be connected to a reservoir. Optional water wagons, standard or inoculating, are available. Also standard is the fleece roller, a removable device on top of the windrow turner, to allow for the use of Compostex windrow covers, which we highly recommend. Compostex aids in management of the compost windrow by keeping excess moisture out and necessary moisture in, by protecting microbes thereby speeding up the composting process and by acting as protection from any potential projectiles. Compostex is 100% UV protected and can last for 5-6 years. The 1014 requires 18� wide Compostex. More, smaller windrows as opposed to fewer larger ones allow for more natural air flow over and through the windrows with a larger surface area exposed for more efficient aerobic production. Larger piles are harder to keep aerobic and risk suffocation and excessive weight constricting aerobic microbial activity. Compacted windrows can lead to anaerobic activity and foul odours. Many feel commercial composting has to be done indoors. Although our machines can be used in enclosed areas usually to protect against excessive rain, composting outdoors or with open ends allows for more natural aeration. Should all commercial composting sites be in vessel? Gathering too much material in one enclosed area can pose odour management issues, especially when there is no formulation strategy. As soon as a door is opened from a pressurized room, odour complaints occur. Naturally ventilated windrows, either outdoors or in an open ended building, offer a cost effective solution. In vessel systems with many conveyors are harder to keep clean and easily collect toxic odorous bio film on any of a large number of surfaces. Foul odour can become embedded in these surfaces. Maintenance problems can also bring on odour issues. In vessel technology was brought into Europe due to space restrictions, which are not nearly as much of a problem in North America. A focus on formulation with proper C:N ratio will reduce the need for expensive ventilation systems. Production per tonnage and operations costs are far higher with In Vessel units. Air follows the path of least resistance. Not all of the compost is aerated leaving anaerobic foul smelling pockets. The compost is not mixed properly and usually poor quality foul smelling compost is the result. Our machines are assembled and ready to ship in 2 - 6 weeks. They can be implemented into production very quickly while other technologies may take many months or years for planning and production. Our machines are easy to operate. Online operator manuals, training, monitor batch tracking are all available. A Composting booklet and DVD and additional recorded educational seminars as well as phone tech support are easily accessible. Database assisted C:N, moisture and structure formulations which are often a challenge are available for all clients. We offer our clients the opportunity to manage and track all procedures during the compost process from formulation to testing. For more info see our online compost management batch tracking app.